Loads of gift sets at Tesco Half Price from tomorrow 08/11/11 inc Vaseline big tin at £3.50! 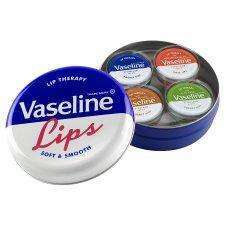 My fave being the Vaseline big lips tin at only £3.50! all you boys buying Call Of Duty for yourselves buy your other halves a cheeky gift to get back in the good books! Link won't work but the original vaseline one does - strange. Anyhoo tpe gift sets into the search bar at tesco and they all come up. Yep should be live at midnight - not sure about the 3 for 2? Might be worth checking the ones that were 3 fr 2 and now 1/2 price on a self scanner. If the discount is applied twice ( a la Terrys Choc orange ) - Bingo! Might be worth checking the ones that were 3 fr 2 and now 1/2 price on a … Might be worth checking the ones that were 3 fr 2 and now 1/2 price on a self scanner. If the discount is applied twice ( a la Terrys Choc orange ) - Bingo! Range of stuff here, looks decent. Or this might be more accurate. This gives 5 pages of current gift sets at half price. Thank you! Will pop out tomorrow now to get some. These have been £5 each or part of the '3 for £10' deal at Morrison's for ages - and they have the big Vaseline tin in blue or a pretty pink (same contents in each) - so £3.33 each as part of the deal. They also have Lynx, Dove and Nivea sets and other things to choose from. These have been £5 each or part of the '3 for £10' deal at Morrison's for … These have been £5 each or part of the '3 for £10' deal at Morrison's for ages - and they have the big Vaseline tin in blue or a pretty pink (same contents in each) - so £3.33 each as part of the deal.They also have Lynx, Dove and Nivea sets and other things to choose from. Laughable thing is, if you look at the Pages now, it shows the price to buy today, (ie.Vaseline Tin) @ £6.00, but then says, Half Price from tomorrow, WAS £7.00, NOW £3.50 ! They aren't even clever enough to 'hide' the previous price! I was going to order a few things for home delivery, on the assumption that even with a delivery charge, I would save money at half price and would stand a better chance of getting what I wanted rather than going to store and also spending money on petrol in the process. Having gone onto the site and booked my delivery slot, I added some things to the basket, and then thought 'Do I REALLY want these?". To be honest, I think that my family are all getting a bit fed up with the same old gift sets (new packaging each year and it all looks very nice, but the same old concept) - we often end up not using everything in the sets anyway. The Vaseline giant tin is an exception because it is something new and is cute, but most other things are pretty much the same as previous years. I had already bought a few sets but I will leave it at that - this order is now abandoned and I shall TRY to think of better stocking fillers! Laughable thing is, if you look at the Pages now, it shows the price to … Laughable thing is, if you look at the Pages now, it shows the price to buy today, (ie.Vaseline Tin) @ £6.00, but then says, Half Price from tomorrow, WAS £7.00, NOW £3.50 ! They aren't even clever enough to 'hide' the previous price! I know, I wonder why they didn't notice that! They seem to have put a lot Of items up by a pound then made them half price, someone failed their maths GCSE! I was going to order a few things for home delivery, on the assumption … I was going to order a few things for home delivery, on the assumption that even with a delivery charge, I would save money at half price and would stand a better chance of getting what I wanted rather than going to store and also spending money on petrol in the process.Having gone onto the site and booked my delivery slot, I added some things to the basket, and then thought 'Do I REALLY want these? ".To be honest, I think that my family are all getting a bit fed up with the same old gift sets (new packaging each year and it all looks very nice, but the same old concept) - we often end up not using everything in the sets anyway.The Vaseline giant tin is an exception because it is something new and is cute, but most other things are pretty much the same as previous years.I had already bought a few sets but I will leave it at that - this order is now abandoned and I shall TRY to think of better stocking fillers! It's a good deal, though. if anyone lives near tesco horwich in bolton you can also pick up a vouchers from the beauty department for £5 off £20 spend, this applies to the gigy sets as i have just used today. so have we worked out if it is 3 for 2 AND half price? If not the half price is not such a great improvement. do you have to pay 3 quid delivery or is there a free delivery code?? I bought a few of these today, the 3 for 2 sign was still on the lynx sets but didnt come off at the till! I quereid it (rather than waiyting half an hr at cust serv, even tho wud have got double difference) anyway they honoured the 3 for 2 and took down the sign!! They are half price now, went onto a white sel last night, will go onto a yellow 'promo' sel tonight for tomorrow at the same price. That's a misleading price indication !!!! wants reporting to Consumer Direct ! Managed to get an Olay set, lynx set and a gilette wash bag full of bits all for £9 with staff discount. Lovely. Good deal if you didn't want to buy 3!